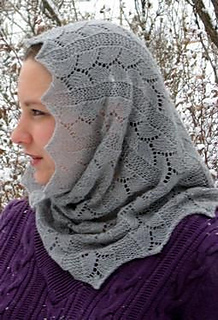 The arcs in this lace pattern remind me of the swirly shapes one would see in frost on windows. This lace cowl is knit in the round, with a luxurious alpaca/silk blend yarn. Both alpaca and silk fibers are known for their insulating qualities, so while this cowl is thin, it?s surprisingly warm. The weather may be frosty, but when you?re wearing this cowl, your neck won?t be!